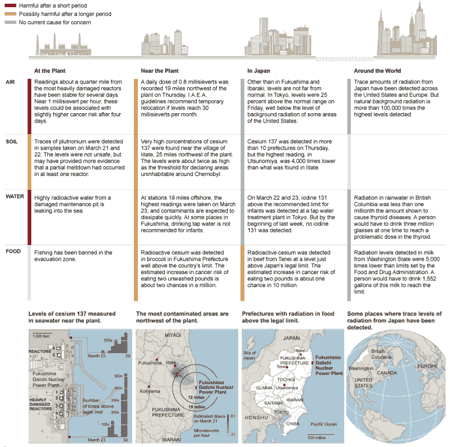 The NYT has compiled a visual summary of the radiation doses from Japan’s Fukushima Daiichi nuclear power complex, distributed by either air, soil, water and food. The current assessments was made possible through the work of the Japanese authorities, the IAEA and others. Separately, Kyodo News Agency reports that water with high levels of radiation has seeped into the sea from Fukushima’s No. 2 reactor, raising wider fears of environmental contamination by the release of radioactivity. The water has been leaking into the sea from a 20-centimeter crack detected at a pit in the reactor where power cables are stored, Japan’s nuclear safety agency said Saturday. Tokyo Electric Power Co. [TEPCO] took steps to encase the fracture in concrete as an emergency measure but the utility co., which manages the nuclear power plant said later that “the amount of leakage was unchanged even after the measure was taken.” No surprise there, as it only re-confirms TEPCO’s incompetence in its ability to get the situation under control. The radiation level in the pit at the No. 2 reactor was more than 1,000 millisieverts per hour, according to Japan’s nuclear agency, while TEPCO noted that radioactive iodine-131 was more than 10,000 times higher than the legal concentration limit was detected in the water found in the pit. Can The Senate Conduct A Limited Nuclear War?